We manufacture and export high quality laminated and un-laminated HDPE Woven Fabrics. These are extensively used in making of bags, sacks etc. The fabric is also used directly to pack / wrap textiles, upholstery, carpets, steel coils, tyres, yarn cones and other industrial products. The HDPE Woven Fabric we manufacture is also available in grades that are used to make tarpaulin covers, open air storage, shelters etc. This is a layered fabric, which has all layers treated with UV stabilizers to provide excellent protection from environmental factors and longevity. The fabric is also used to cover aircrafts, trucks, tempos, trailer trucks, railway wagons, industrial machines in open. 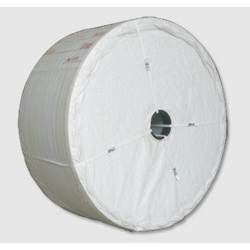 Established in the year 1995, we, “SHUBHAM POLYSPIN LIMITED ”, are counted among the leading organizations engaged in offering a wide and exclusive range of HDPE Woven Bags, PP Woven Bags, Woven Fabrics, Laminated Bags, Unlaminated Bags, Liner Bags, Polypropylene Multifilament Yarn, Gusseted Bags, Cement Bags and Fertilizer Bags to our esteemed patrons. These products are widely demanded in a number of cement and agricultural industries for the purpose of packaging raw material. In addition to this, we manufacture these products using high-grade quality raw material, procured from trusted and reliable vendors of the market. Moreover, these products are widely appreciated by the clients for their longer life span, excellent strength, varying capacities, availability in varied specifications, eco-friendly nature and other such quality attributes. For the purpose of manufacturing and storing this premium range of products, we have a sound and sophisticated infrastructure sprawling over a vast area, well-equipped with the latest technology, advanced machinery and equipment. In addition to this, our infrastructure has been segregated into a number of departments such as manufacturing unit, R&D unit, quality control unit, sales and marketing unit and others, for the purpose of carrying out the process of production in a sound and sophisticated manner. Also, these machines and equipment are upgraded with time in accordance with the advancements in technology so as to remain ahead in this highly competitive industry. Further, in order to operate these machines and fabricate our flawless range of products, we are backed by a team of highly qualified and experienced professionals.